Laparoscopy has gained importance in the abdominal emergency surgery field. Acute appendicitis is one of the major indications for emergency surgery, being laparoscopy the gold standard approach. A 39-year-old female was admitted to our Emergency Department due to hypogastric abdominal pain, also with nausea and fever. The patient did not have any family nor personal history of renal disease. Her preoperative work-up included complete blood tests showing absence of alteration in serum creatine, BUN and electrolytes; also, with the presence of leucocytosis with left shift and no other significant findings. According to Hospitals’ Emergency Protocol, abdominal ultrasonography was performed supporting the clinical suspicion of AA, no further imaging studies were carried out. Emergency surgical treatment was decided performing a LA. A Foley catheter was placed to monitor both, IAP and urine output (UOP). During intervention gangrenous appendicitis was observed, also with the presence of important purulent peritoneal fluid in the lower pelvis. The procedure was completed with a pre-stablished pneumoperitoneum of 12 mmHg (0 016 Bar) and a set air-flow of 3 litres/minute. Overall surgical time was of 45 minutes. During procedure, the patient showed no haemodynamic instability, and maintained an adequate UOP with no transient IAP. On the first postoperative day, the patient reported persistence of continuous abdominal pain and oliguria (UOP of 300–325 ml/day). Postoperative serial blood test revealed a progressive rise of creatinine levels to a maximum of 5,75 mg/dl; consistent with acute kidney injury (AKI) according to RIFLE criteria [2, 3]. C-reactive protein levels increased to 312 mg/dL with a progressive subsequent decrease. Procalcitonin (PCT) levels, as other clinical septic parameters remained within normality. No correlation was observed between blood tests septic parameters and RF alteration. Surprisingly, despite oliguria and RF impairment no alterations in blood electrolytes were observed. Drug dosage, including antibiotics, required adjustment according to glomerular filtration rate. No nephrotoxic drugs where administered. After conservative treatment with fluid resuscitation and intravenous bicarbonate 1/6 M daily-bolus a complete restoration of RF, also with normalization of UOP, was observed in 48 hours. 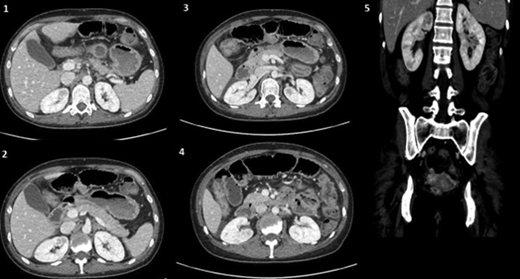 Control CT-scan showed presence of focal hypodensities in both kidneys, reported as potential renal scars. The patient was discharged on Day 16.